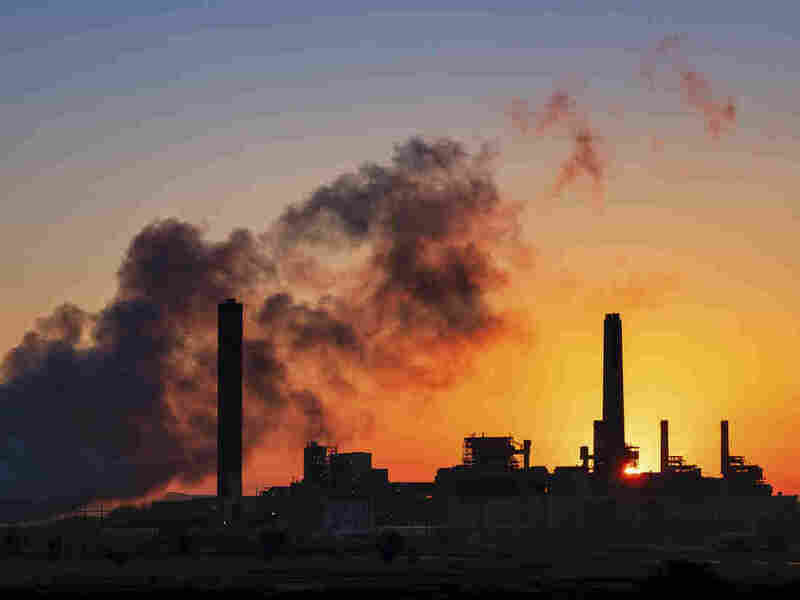 After Midterms, Democrats Hope To 'Change The Narrative' On Environmental Rollbacks Democrats are making Trump's environmental rollbacks and climate denial a big issue in swing races this fall. If they take the House, they plan lots of oversight hearings and tough questions. The Dave Johnson coal-fired power plant against the morning sun in Glenrock, Wyo. Democrats in some midterm swing races are targeting the Trump administration's environmental rollbacks and climate denial. The environment is not typically a top issue for American voters. But this has not been a typical year. California saw the largest fire in state history. North Carolina was inundated by water from a massive, slow-moving storm. The Florida Panhandle is still combing through the wreckage left by Hurricane Michael, the strongest storm to hit that part of Florida in recorded history. It made landfall just days after the world's top climate scientists issued perhaps their strongest warning yet about the threats of human-caused climate change. While none of this has pushed the environment over issues like healthcare or immigration in the minds of most voters, environmental groups and Democrats are hoping the recent string of natural disasters and the Trump administration's efforts to rollback dozens of environmental laws will be key in November's midterms - particularly in disaster-struck states like California and Florida, where a number of House seats are closely contested. "People are seeing first-hand the devastating impacts that climate change is having," says Tiernan Sittenfeld, the senior vice president for government affairs with the League of Conservation Voters. "And they're going to be far more likely to support elected officials and candidates who are going to stand up for them and not with the corporate polluters the way that Donald Trump and the Republican leadership in Congress does over and over again." The League of Conservation Voters is pouring $60 million into the upcoming midterms, targeting Republican incumbents and candidates who have supported the Trump administration's deregulatory agenda or echoed the president's doubts about climate change and its causes. The goal of the campaign is to flip Congress, or at least the House of Representatives, to Democratic control, where the party can serve as a check on the Trump administration. "I want to change the narrative of this whole thing," says Arizona Rep. Raul Grijalva, the ranking Democrat on the House Natural Resources Committee. "Where the Resources Committee isn't just a passive part of the Trump administration, that they're independent and that they have responsibility as co-equals for oversight and accountability." The word "oversight" is one you hear a lot from Democrats, in part because there's not a lot else they could do. Nearly all the rollbacks in environmental policy are happening in the executive branch under Trump appointees. A shift in House leadership won't change that. But while Democrats could not force Interior Secretary Ryan Zinke to restore Bears Ears National Monument, for example, or to crack down on methane emissions from natural gas operations, Grijalva says they could force Zinke to explain himself. So expect hearings. Lots of them. And Trump backers agree they would have an impact. "They would be able to tie up [agencies] mercilessly, so that they would kind of be able to slow walk a lot of the good work that's being done on these issues," says Tom Pyle, president of the American Energy Alliance, which supports Trump's environmental agenda. What's more, he says, it would give environmental groups and Democrats a stage to frame an anti-Trump narrative. They could hold hearings on the Clean Power Plan rollback or changes to the fuel efficiency standards, putting the head of the Environmental Protection Agency, Andrew Wheeler, in the limelight. They could even try to bring ousted EPA chief Scott Pruitt in for questioning. "You're going to be seeing us look more in depth at conflicts of interest and corruption at the EPA," says Colorado Rep. Diana DeGette, the ranking Democrat on the oversight committee for Energy and Commerce. DeGette says this year's midterms remind her of what happened in 2006, when Democrats took back the House under President George W. Bush. For the following two years, Democrats called hearings and investigations and crafted legislation that they knew wouldn't pass under a Republican president. "But then when President Obama was elected in 2008, we were able to move a robust legislative agenda because we had spent the last two years developing it," she says. Republicans are hoping that's not the case. Many of the Trump administration's environmental changes have been long-held targets of conservative groups. Finalizing the rollbacks is complicated and takes time, time they hope they will have.